1. Sum of total number of boys, girls and teachers in school A is what percent of the sum of total number of boys, girls and teachers in school D? 2. Find the respective ratio between total number of boys, girls and teachers in school B and that in school C.
3. Find the difference between total number of boys and total number of girls from all the schools together. 4. Total number of boys, girls and teachers of school E is what percent more/less than the total number of boys, girls and teachers of school F? 5. Find the sum of total number of teachers from all the schools together and total number of students of schools A and C.
1) Sum of total number of boys, girls and teachers in school A is what percent of the sum of total number of boys, girls and teachers in school D? 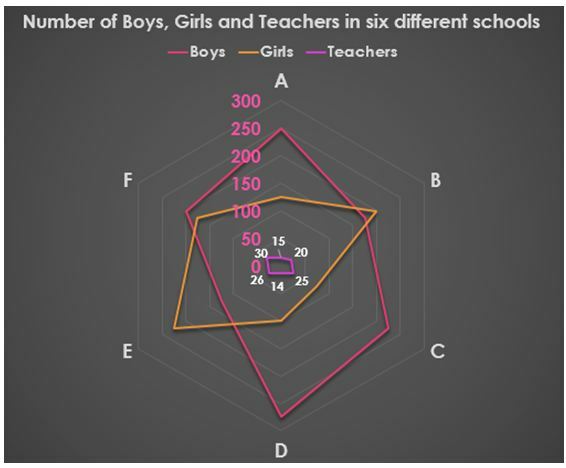 2) Find the respective ratio between total number of boys, girls and teachers in school B and that in school C.
3) Find the difference between total number of boys and total number of girls from all the schools together. 4) Total number of boys, girls and teachers of school E is what percent more/less than the total number of boys, girls and teachers of school F? 5) Find the sum of total number of teachers from all the schools together and total number of students of schools A and C.